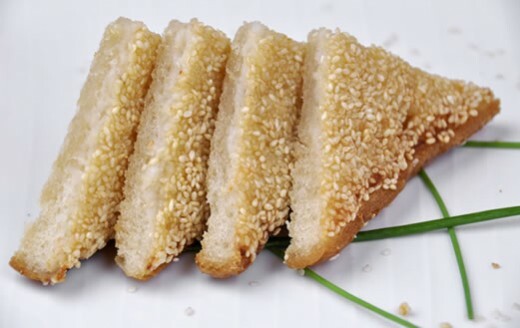 Sesame Prawn Toast is one of the most delicious starters on the Chinese Menu. All our Sesame Prawn Toasts are produced in our dedicated temperature-controlled room. In this strictly monitored environment, we use only the highest quality sticky prawns to provide the best flavour. Traditional prawn toast has minced prawns concentrated in the middle of the toast. We have improved it so that the minced prawns are evenly spread across the entire toast, before they are topped with sesame seeds. Full enjoyment is ensured with every bite of Kim’s Sesame Prawn Toast.